TOKYO - A group of multiparty lawmakers will submit to the Diet this year a bill aimed at dealing with Japan's low representation of women in politics, which puts the country near the bottom of global rankings on the issue, political sources said Wednesday. However, the bill will only ask political parties to "make efforts" to field men and women in equal numbers as candidates in national and local elections, and will not penalize its violators. Among politicians who have been working on the bill are Internal Affairs and Communications Minister Seiko Noda of the ruling Liberal Democratic Party, who also serves as minister for gender equality, and Masaharu Nakagawa, a lower house member of the opposition Democratic Party. The ruling and opposition parties submitted similar bills to the ordinary session of the Diet last year and were set to unify the bills, but the two sides gave up the plan after allegations of cronyism against Prime Minister Shinzo Abe took center stage in parliament. The bills were scrapped after the lower house's dissolution. According to the Inter-Parliamentary Union, a global organization of national parliaments based in Geneva, women accounted for only 9.3 percent of Japan's lower house members before the election in October last year, putting the country at 165th of 193 countries. The ratio grew slightly to 10.1 percent after the election, but is far from the 30 percent aimed at by the Japanese government as a percentage of women among people holding leadership roles. The government said it will attempt to achieve the goal by 2020. In the campaigning for the October election, many political parties pledged to increase the number of women in politics. But of the 332 people who ran in the election as the LDP's official candidates, only 25, or 7.5 percent, were women. The percentage was the lowest among major political parties. The highest was 24.4 percent in the opposition Constitutional Democratic Party of Japan, compared with 17.7 percent occupied by women among all candidates in the election. Women's representation is equally low in Japanese regional assemblies. According to statistics compiled by the internal affairs ministry in 2016, women accounted for 10 percent of members of prefectural assemblies, 15 percent of city and ward assemblies, and 10 percent of town and village assemblies. There was no woman in 32 percent of Japan's town and village assemblies. 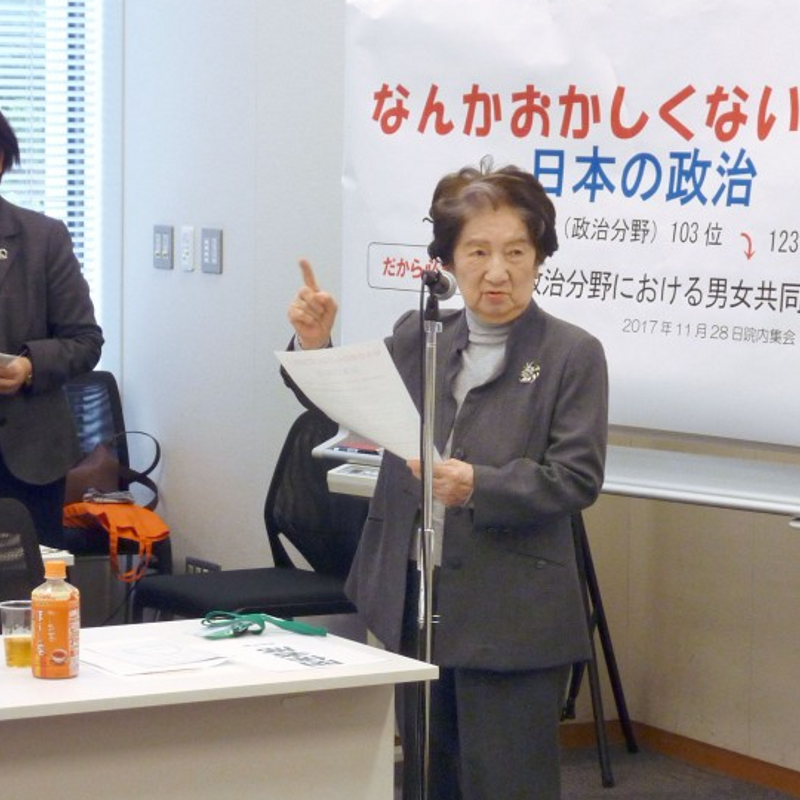 Commenting on the planned non-binding bill, Reiko Oyama, a professor of political systems at Komazawa University, said it is still a positive "first step" because voters will find it easier to demand political parties increase woman candidates. Mieko Nakabayashi, a professor of international public policies at Waseda University, said voters should demand parties choose "women who can represent the interests of women as candidates, not those who will be puppets of senior officials with an old sense of values."